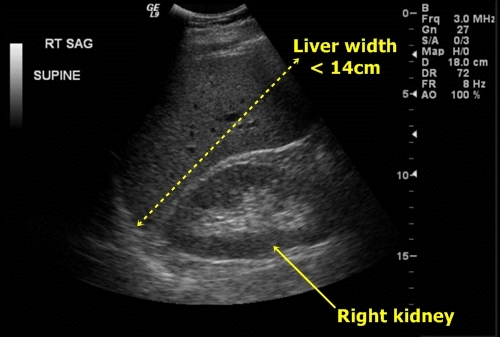 Liver is an organ which is very well viewable by sonography. 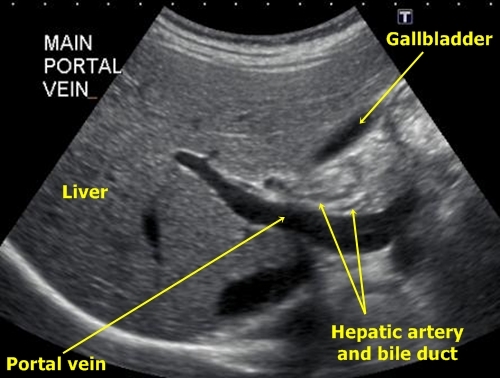 We examine it by patient lying on his back or on his left hip (better image of liver hilum). Liver is examined by fan-shape movement by probe in both sagittal and transverse plain. Liver is much more visible during inspiration. Liver hilum (portal vein, common bile duct, hepatic artery) is displayed in right subcostal space. The probe is rotated from transverse plain for approximately 45° clockwise. 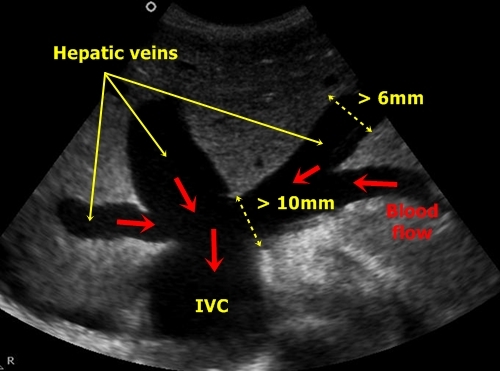 Hepatic veins width: under 6mm for peripheral hepatic veins, under 10mm liver veins before entering the inferior vena cava. line. This cut also often displays right kidney. Liver hilum – It is the entrance of hepatic artery, portal vein and departure of common bile duct from liver. In this area we can measure the width of portal vein and most importantly the width of the bile duct. It is common that bile duct and hepatic artery are located above the portal vein. We can differ them by using Doppler sonography. Hepatic artery shows blood flow, bile duct does not. the blood flow it is practically impossible to differentiate them. Portal hypertension – Portal vein is broader than 15mm, we also find splenomegaly and often ascites (anechogenic black fluid in abdominal cavity). Liver congestion by right-sided heart failure – We find dialted peripheral hepatic veins over 6mm. We can sometimes find fluid in pleural cavity above the diaphragm. near influx into inferior vena cava are wider than 10mm. Liver steatosis – The liver echogenity is higher than normal. Liver parenchyma becomes brighter than right kidney parenchyma. In sagittal projection we can easily display both organs and make a comparison. 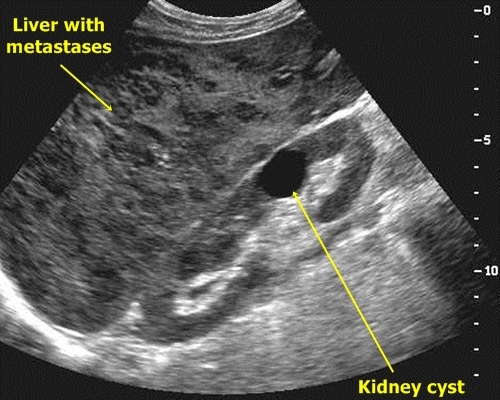 Liver cysts – It is a very common finding. They are anechogenic black round regular objects inside the liver parenchyma. Often we can see a conic bright shadow behind them (acoustic amplification). structure with a conic bright shadow behind it. 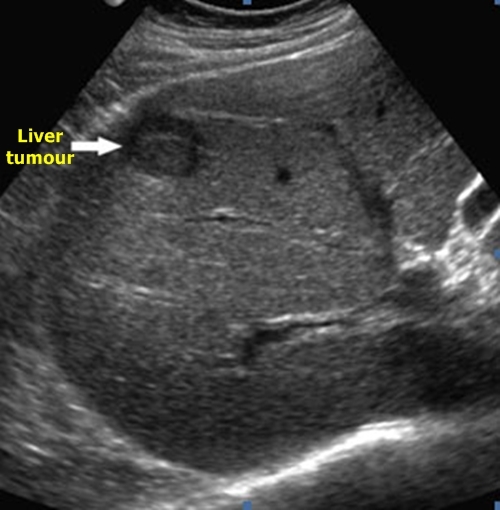 Liver hemangioma – They are displayed as distinctly bordered hyperechogenic areas. Liver cirrhosis – By liver cirrhosis we find irregular rough liver margins (macronodular or micronodular cirrhosis). 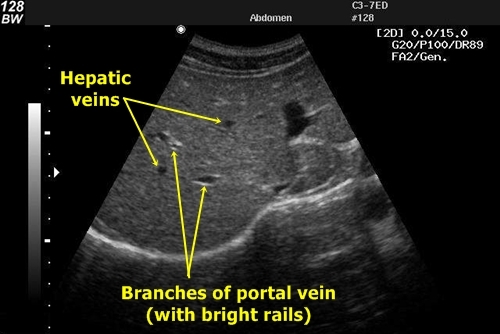 Liver veins connect in open angles. Parenchymal echogenity is higher and the tissue seems to be granular. 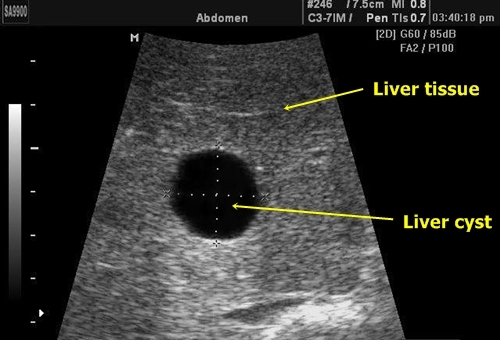 In advanced stages of the cirrhosis liver size dwindles and we find marks of portal hypertension (ascites, portal vein dilation, splenomegaly). 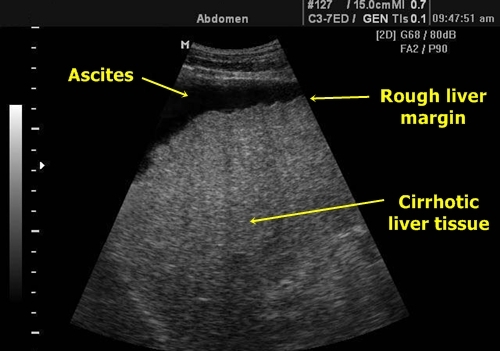 rough liver margins and ascites in the surroundings. Common bile duct dilation - It is a very imporntant finding and means dilation of bile duct over 6mm (or over 9mm by patients after cholecystectomy). 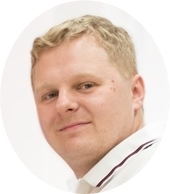 The most common causes are gallstones and local tumours. 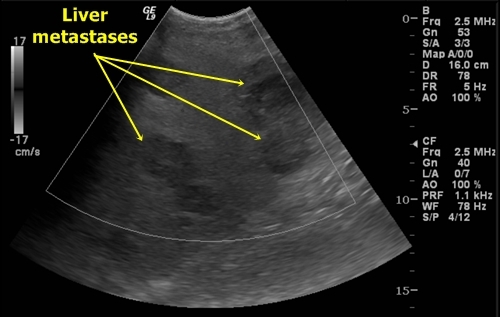 The ultrasound, however, does not always find the cause. Bile duct dilation – It is a pity I was not able to find such a great picture in better quality. 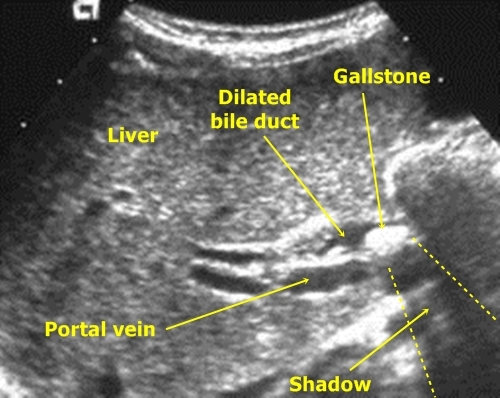 of the dilation – bright gallstone with dorsal acoustic shadow obstructing the bile duct. 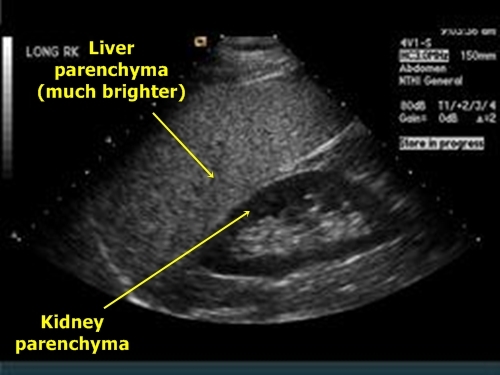 Liver tumor – It has different echogenity from surrounding parenchyma. It often oppresses neighbouring liver tissue. the patient was later diagnosed with a hepatocellular liver carcinoma. Liver metastases – They are bearings of different echogenity than liver tissue. They have typically a hypoechogenic margin (halo). 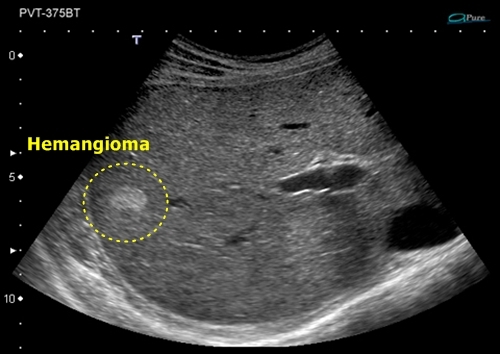 there is a renal cyst, which is a casual (and in this case probably insignificant) finding.